Wellington born Elizabeth McRae began her long theatre career in the mid 50s, while studying for a Bachelor of Arts at Victoria University. In 1968 she was a founding member of Auckland's Mercury Theatre. McRae's first screen credit dates to 1973, to her role in Rudall and Ramai Hayward’s The Doll’s House, an adaptation of the short story by Katherine Mansfield. McRae also helped out behind the scenes. She remembers it as a slow production — by the time it finished, one of the child actors "had grown second teeth, and she had little teeth when she started!" The film would be the last to involve Rudall Hayward, a Kiwi film pioneer who passed away in May 1974. McRae’s debut television role came the same year, with children's series The Games Affair. The tale of teens investigating strange goings on was set during the 1974 Christchurch Commonwealth Games. McRae played the mother of one of the show's teen heroes, wife of Tama Poata’s character Henry Ropata. Her screen career got busier in the 1980s; the television roles included Mortimer's Patch, Robin Hyde drama Iris, and playing one of the witnesses in the classic Minnie Dean instalment of Hanlon. In 1987 she co-starred in an episode of anthology series About Face; Return Journey chronicles longtime tensions between a mother and her grown daughter, when the daughter returns for a visit to the family house. McRae's most iconic television role began in 1992, when she joined new soap Shortland Street as receptionist Marjorie Neilson (later Brasch). "Busy, opinionated, a terrible gossip," wrote the Herald's Michele Hewitson in a 2002 piece on her favourite Shortland Street characters. "She was everyone's favourite Aunt, with the flapping mouth and the big heart". It was Marj who spoke the iconic soap’s first line, answering the phone with the introduction “Shortland Street Accident and Emergency Centre”. Soon to become a fan favourite, the character would experience an illegitimate daughter, a disappearing husband, and the moment her scarf got dangerously caught in the office equipment. McRae stayed until 1996, when her character left to become a Member of Parliament — and appeared in a scene alongside real-life MP Helen Clark (in 2002 McRae cameoed in low budget comedy All About Reinalda, as Prime Minister Brasch). Originally many of the actor's friends were skeptical. One told her "'You're prostituting your art! How can you do it?' and then about a year later he said 'oh, isn't it going well!'" She would return to guest on the show in 1998, 2002, and on the 20th anniversary special, before making a memorable final departure on 2017's 25th anniversary special. In 2011 big screen comedy Rest for the Wicked, McRae joined an ensemble of acting veterans — including Tony Barry, Ilona Rodgers, Irene Wood, and her on screen husband Ian Mune. "We played it in Remuera Gardens which was an old people's home," remembers McRae. They were very welcoming to us at first, I think they got very fed up with us in the end." She also starred in 2008 short film Journey to Ihapa, as a mother reuniting with her estranged Māori son, and NZ Screen Award nominee My Father's Shoes (2004). She went on to appear in the second and third seasons of The Brokenwood Mysteries, as town gossip Jean Marlow. In 2006 McRae and her husband Don were both made Officers of the New Zealand Order of Merit for services to theatre, and services to architecture and the community respectively. 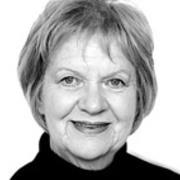 In September 2016 Elizabeth McRae was honoured with the Equity Lifetime Achievement Award for her long career as an actor and voice and acting teacher.